Really cold today. Not as cold as yesterday night (which was the coldest day of the season so far), but still very nose-nippy outside. It is also officially dark at 4:30pm. When the weather takes a sharp turn like this, I often start to crave something spicy and bright. This recipe is from the current issue of Food and Wine, and suits my tastes and my mood perfectly. The spices are so warming; they make me dream of locales where the sun shines all the time. The coconut milk makes the curry smooth and creamy, and the spritz of lemon juice makes the whole dish sparkle. Another great thing about this recipe? It’s something new and delicious to make with ground beef that isn’t hamburger, meatloaf, or meatballs! Adapted by Grace Parisi from the amazing Julie Sahni, this recipe strangely seems to have not been uploaded to the magazine’s website yet. I have basically kept the recipe as published. However, I have reduced the amount a liquid a bit so it isn’t so watery (you might choose to reduce it even more). Even though Parisi’s recipe doesn’t call for lemons, a hit of acid just seems like such a natural addition to make the flavors pop. 1. In a large Dutch oven, heat the oil over medium-high heat until it begins to shimmer. Add the ground beef. As it cooks, use the edge of your wooden spoon to break up any lumps. Continue to brown the meat until there is no longer any pink, about 5 minutes. 2. Add the onion, the ginger, the garlic, and the curry powder. Season everything with salt and pepper. Continue to cook the meat mixture until the onions begin to soften and become translucent, about 3 minutes. 3. Add the potato, the stock, the coconut milk, and the diced tomatoes and their juices. Stir everything to combine. Bring the everything to a boil, and then turn the heat down to a simmer. Cook the curry until the sauce has thickened, and the potatoes are tender. 4. Using the back of your wooden spoon, lightly crush some of the potatoes against the side of the casserole. Adjust the seasoning. Add the peas, and continue to simmer the curry until they are heated through. Adjust the seasoning for a final time. Top the beef keema with cilantro and a squeeze of fresh lemon juice. Serve with either basmati rice or naan. Now I’m hungry! I love curries! I do too! I need to cook more of them . . . This looks yum. 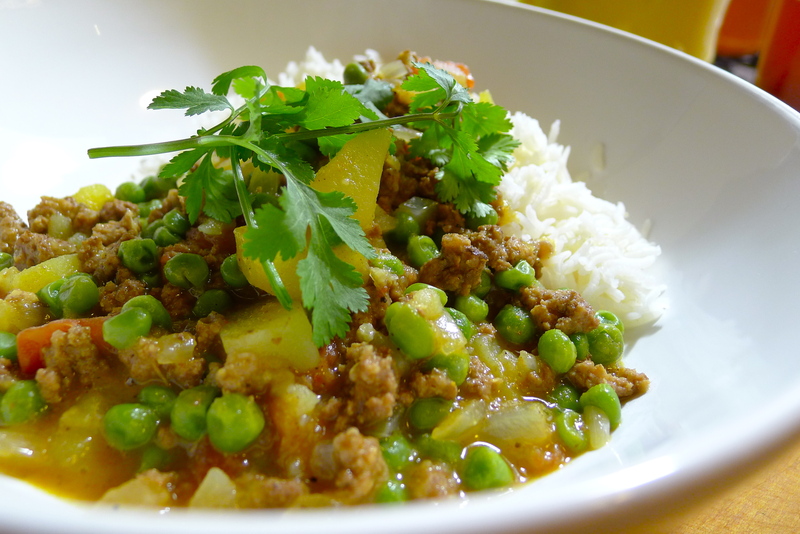 I did a keema not so long ago and it proved to be one of my favourite recipes! I definitely think this will make a frequent appearance on the dinner table this season. So easy and so delicious! Looks delicious! The flavors sound complex and rich. Thanks for the link to the guinea pig calendar! So cute! You know, I’ve been seeing guinea pig things everywhere now. It’s like a cavy cultural zeitgeist! I’m definitely going to make this! I’m constantly looking for interesting ways to use the ground beef from High Point now. It’s actually kind of a fun challenge. Me too! I always keep my eyes peeled for something different to do with ground beef. Speaking of which, I should stuff more vegetables with it this season . . .